Anyone looking to take a significant position in the Irish private rented sector will be taking a closer look at the Marker Residences, currently being offered for sale by the Dublin office of agent Savills. An asking price of EUR40 million has been put on the block, containing 84 apartments on a site overlooking Dublin’s Grand Canal Docks. The block, which also includes a small commercial element of 898 sq metres, is effectively fully let and generates around EUR2.5 million a year in rental income. The block is sure to be of interest to Canadian residential investor CAPREIT which, through its newly established Irish company IRES REIT, is already making significant inroads into the Irish market, as reported here. Savills describe the block as “one of Dublin’s most prestigious residential developments” with the property offering “a rare opportunity to acquire a fully income producing trophy asset”. More details here. Agent Savills has calculated that current planning policies will lead to a shortage of 160,000 homes across the south of England by 2018. Local planners are simply not allocating enough space for new development in their areas, to meet expected demand. The problem is, while each of them is relying on someone next door or nearby to take up the slack, every authority is playing the same huge game of NIMBYism – the Not In My Back Yard approach to housing development. Savills took the UK target of 240,000 new homes needed a year in England, a figure calculated by the Town & Country Planning Association, and drilled down to individual areas. Thurrock, Dartford and Gravesham are just three areas – all to the east of London – where sensible provision has been made. The majority of other local authorities are failing to meet demand, with Surrey, Berkshire and Buckinghamshire noted as falling considerably short of need. 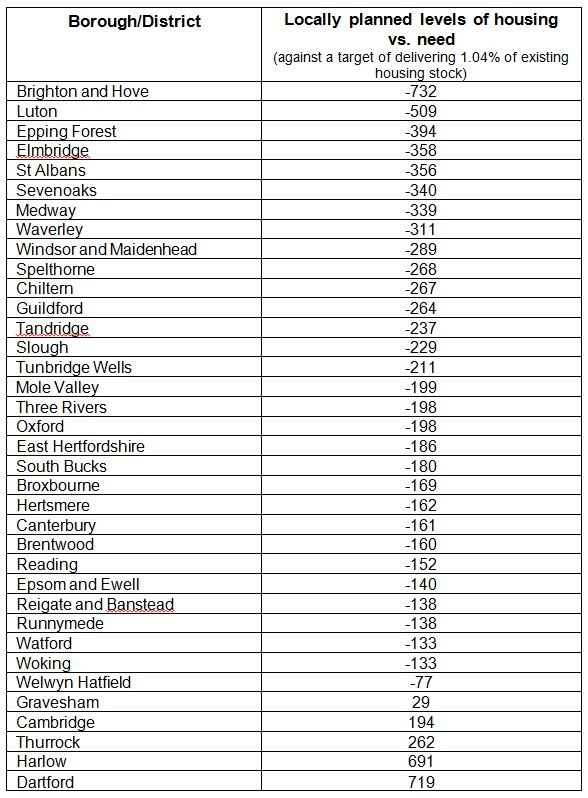 Savills list showing housing provision shortfall, area by area. Savills has suggested local authorities need to form an “arc of cooperation” to help address the situation. The big problem is, with an election not too far off, there are no votes in housing developments – most people, if asked, would prefer not to see development near where they live. More details on Savills’ findings here.